Jericho Form: The skulls of people were separated from their bodies and covered over with plaster. 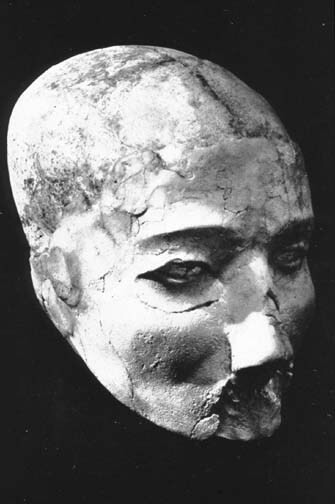 They were sculpted to look like a person before he or she had died. The eyes were then inlayed with shells and hair was painted onto the head and sometimes face in the case of a man having a mustache.Iconography: They may have been icons of ancestors and used as fetish objects. 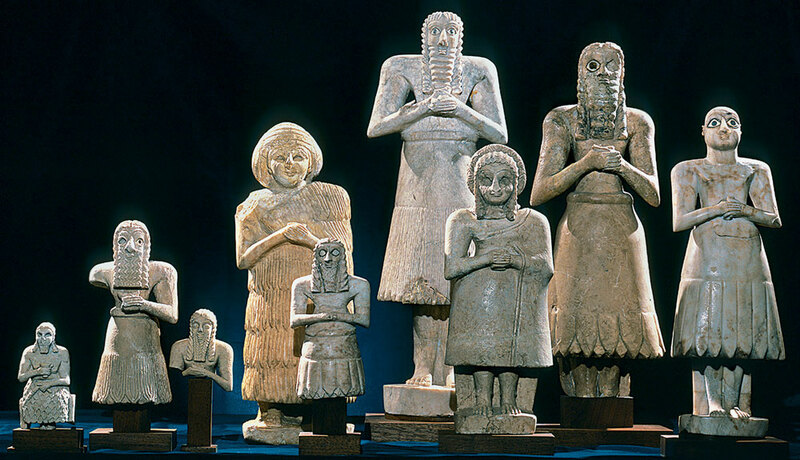 They may also be an icon of the people of Jericho's belief in an afterlife. They were an icon of wisdom because they were consulted on serious matters. Anatolia, Turkey Form: This city has no streets. The buildings are all attached and the entrances to the rooms were on the ceiling. The houses were made of timber frames and mud brick, the insides were plastered. There were platforms along the walls and shrines in many of the houses. In these shrines were bulls horns, plastered breasts, wall paintings and animal heads.Iconography: The plaster breasts found in the shrines are symbols of fertility and the bulls horns also found in the shrines are symbols of virility. The style that the city was built in is iconographic of the need of the people for protection. The shrines and dead people are an icon of the heavy influence of religion and possible ancestor worship. 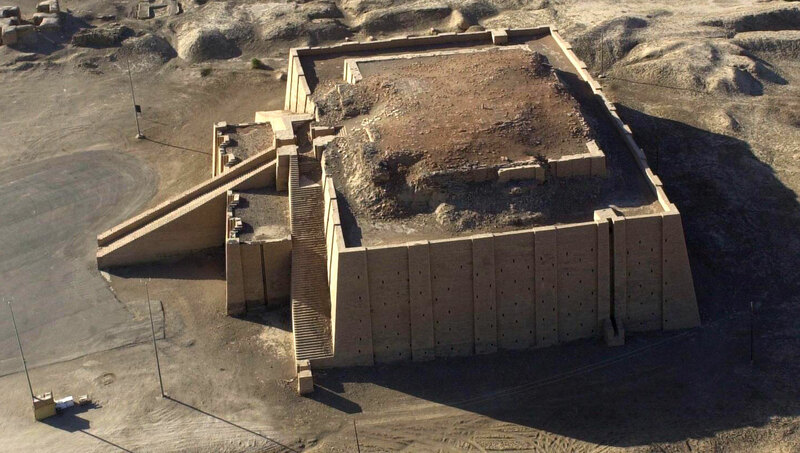 SumerianForm: Overall the temple is built in two levels entirely of mud brick: in the lower level the bricks are joined together with bitumen, in the top level they are joined with mortar. No ziggurat is preserved to its original height. 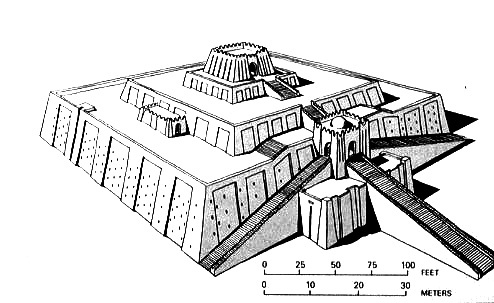 Ascent was by an exterior triple stairway or by a spiral ramp, but for almost half of the known ziggurats, no means of ascent has been discovered. 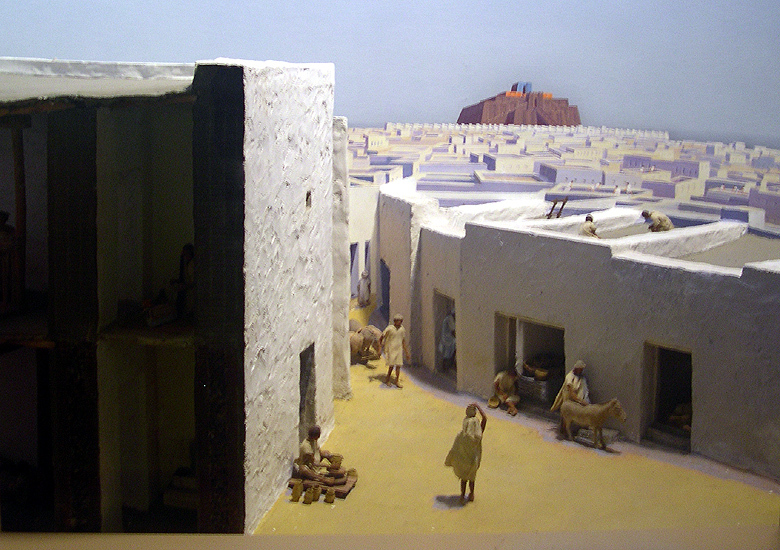 The sloping sides and terraces were often landscaped with trees and shrubs (hence the Hanging Gardens of Babylon). The best-preserved ziggurat is at Ur (modern Tall al-Muqayyar). The largest, at Chogha Zanbil in Elam, is 335 feet (102 m) square and 80 feet (24 m) high and stands at less than half its estimated original height. The legendary Tower of Babel has been popularly associated with the ziggurat of the great temple of Marduk in Babylon.The city of Ur, modern Tall Al-muqayyar, or Tell El-muqayyar, important city of ancient southern Mesopotamia (Sumer), situated about 140 miles (225 km) southeast of the site of Babylon and about 10 miles (16 km) west of the present bed of the Euphrates River. In antiquity the river ran much closer to the city; the change in its course has left the ruins in a desert that once was irrigated and fertile land. The first serious excavations at Ur were made after World War I by H.R. Hall of the British Museum, and as a result a joint expedition was formed by the British Museum and the University of Pennsylvania that carried on the excavations under Leonard Woolley's directorship from 1922 until 1934. Almost every period of the city's lifetime has been illustrated by the discoveries, and knowledge of Mesopotamian history has been greatly enlarged. Sumerian/MesopotamiaForm: It is made of wood, shells and stone. 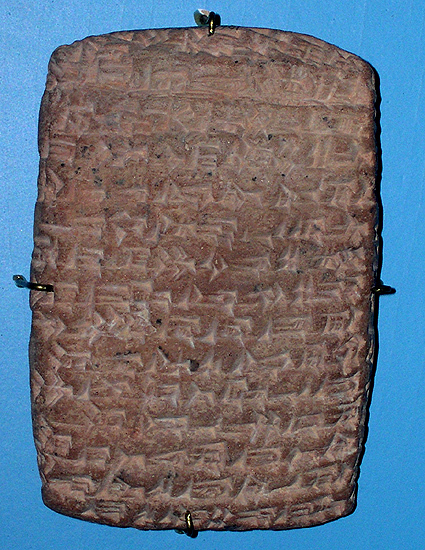 The Standard of Ur is broken up into the war side, middle left, and the peace side, top left. The war side, on the bottom, features horse drawn chariots running over people. In the middle, the prisoners have been captured and are being lead. On the top, the prisoners have been striped naked and are being presented to a king figure. He is the largest figure in the piece and he is also centered on the band. On the bottom, of the peace side, men carry provisions. In the middle they lead animals, and on the top a banquet takes place where the king figure is present again. At this banquet there is a lyre player and a singer, they are shown in detail on the bottom left. 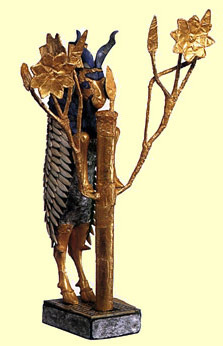 Wood, gold, lapis lazuli Form: It is made out of wood, gold and lapps lazuli. Great attention to detail has gone in to the making of this piece. Each of the flowers have eight points and each little ruffle in the goats wool is depicted.Iconography: Goats are symbols of fertility, power, and mans struggle with his animalistic side. The tree may be a symbol for the tree of life. 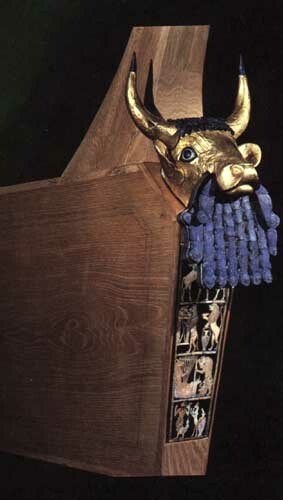 The goat may also represent the fertility god Tammuz. Form: This is a musical instrument that is made of wood, gold, lapis lazuli. and shell. The head of the bull is very naturalistic despite the beard. The top register of inlayed shell, directly beneath the bulls beard, depicts an athletic man holding two bulls with human faces. The second register shows animals, walking like men, bringing food for a feast. 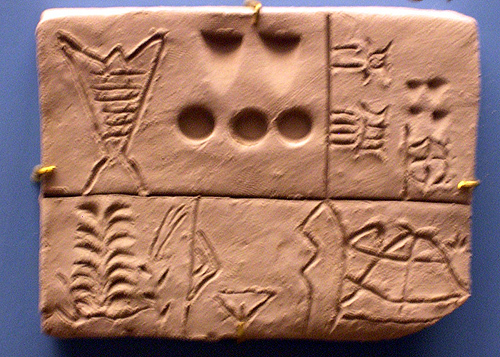 The third register shows the animals making music. 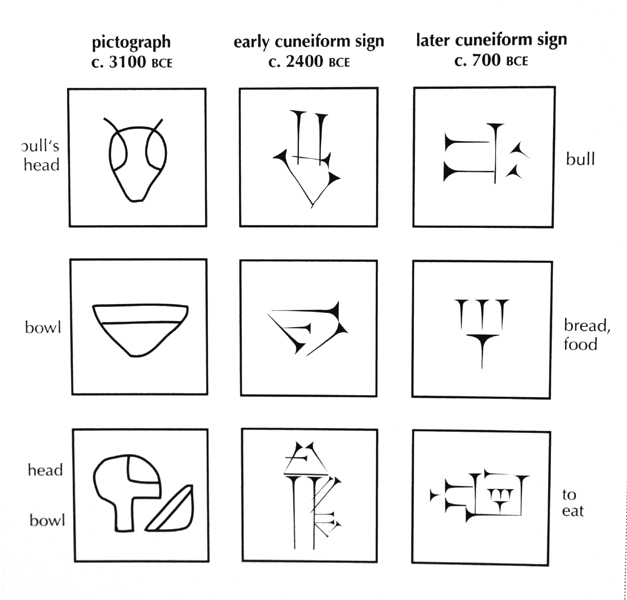 Finally, the fourth register shows a scorpion man being offered cups from a gazelle.Iconography: The panels on the Lyre are iconographic of the humanization of animals. It is iconographic of the after life and the animals might be icons of the ones that guard the gate to heaven. It is a symbol of death because it was played at Queen Puabi's funeral. Akkadian Form: This is a low relief carving on limestone. 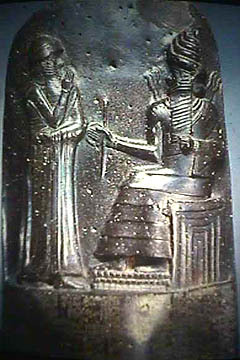 The figures are all in composite form.Iconography: Proportionately the main figure of the king Naram Sin is exaggerated to emphasize his status. When a figure's scale is emphasized in this manner it is referred to as hieratic scale. (You will also see this in Egyptian art. Naram-Sins helmet is adorned with bull horns. Since bulls are powerful and virile creatures the horns are associated with his physical power as warrior. horns on his head are also an icon for power and virility, also symbols of a king. The stars or sun in the right hand corner are symbols of divine support. He's also holding a newer kind of weapon in his left hand called a composite bow which could also represent the Akkadian armies innovative battle technology. Form: Made from bronze, this portrait head was probably part of a larger work. Perhaps a full figure. The shape and proportions of the face and head are naturalistic but the shape and texture of the eyebrows and hair are stylized in a geometric fashion. Other stylizations or distortions occur in the exaggerated size of his eyes and nose. These stylizations and exaggerations are attempts to idealizethis ruler and make him more handsome or beautiful than he probably was according to the ideals of physical perfection in the ancient near east. Iconography: In most cultures, beauty and goodness are equated as being one in the same thing. Certainly the cultures of Mesopotamia felt this way as well. Therefore the portraits beauty is also equated with Sargon's inner beauty and or virtue. His "virtuous" nature is symbolically enhanced by his beard. Beards are icons of wisdom and because in order to grow a beard one needs to have matured to appoint beyond childhood. (This same idea is evidenced in several versions of the Arthurian legends in which although King Arthur was able to pull the sword from the stone, his brothers still refer to him as "beardless" and therefore too inexperienced or young to rule. 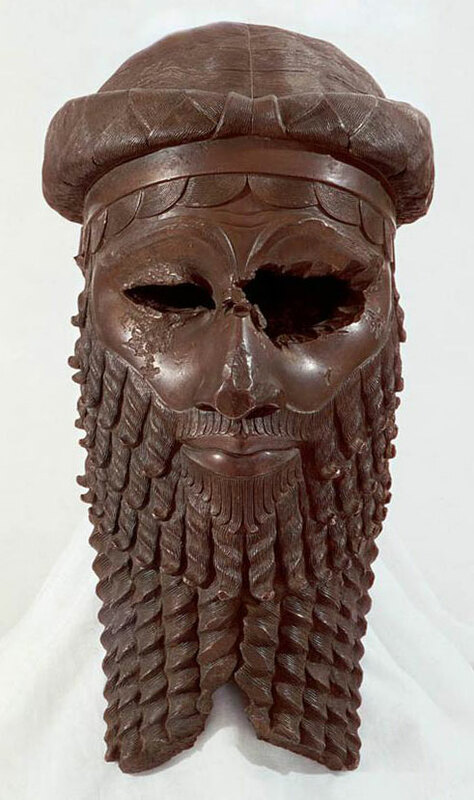 Sargon the Great of Akkad is the first in a long (and possibly ever-extending) line of people whose life is driven by conquest. He was the first emperor of the world’s first empire. 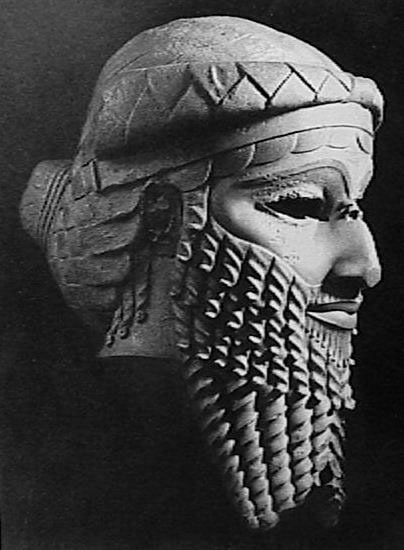 However, like most of the people who followed him, his empire didn’t last long.According to legend, Sargon’s mother was “changeling,” meaning a demon or a prostitute. He was probably born around 2350 BCE. 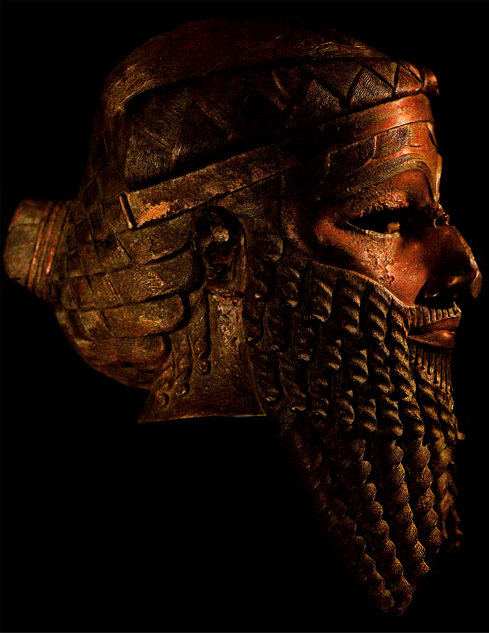 He served as the cup-bearer of a king of the Sumerian city-state of Kish, but the king, sensing something divine in him, had Sargon killed. Sargon escaped the plot, rallied some tribesmen to his cause, and built a new city north of Sumer – Akkad. Sargon’s career has soared ever since. 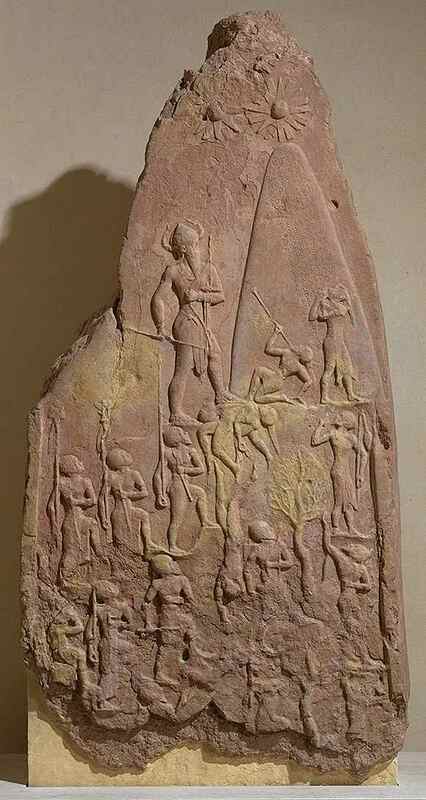 From Akkad, his armies blazed southward to conquer Sumer, Kish and all. From the Persian Gulf, he made a northwestward sweep to Lebanon. 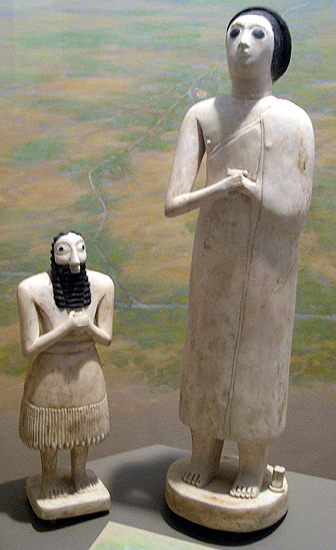 SumerianForm: The statues are made of gypsum and inlayed with shell and black limestone. The men have long hair, beards, belts, and fringed skirts. The women wear dresses that leave the right shoulder bare. The eyes are exaggerated, while the hands are downplayed.